Place the fruit and the sugar in a nonreactive bowl, jar or plastic bag. Crush the fruit with a muddler or, if using a bag, squeeze lightly. 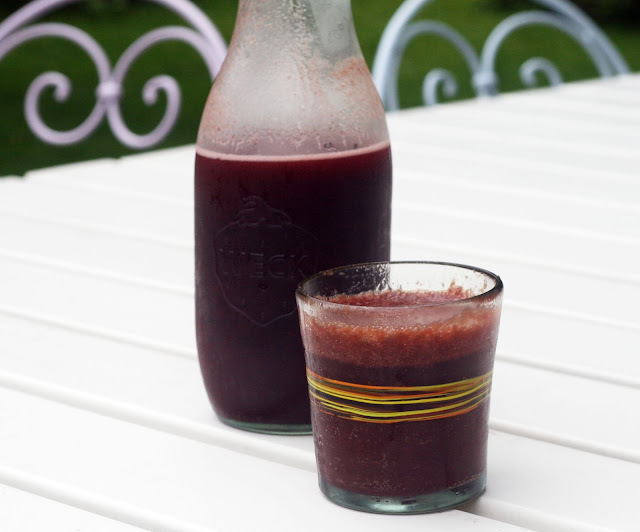 Refrigerate 24-48 hours or until the juices are well seeped and starting to form a syrup. Place a metal sieve over a bowl and mash the fruit with a potato masher until any large pieces are well mashed. Whisk the mashed pulp through the sieve. Discard the pulp. Pour the resulting liquid back into the nonreactive container, stir in vinegar and refrigerate until ready to use. Try it as-is, stirred into club soda, still water or if feeling naughty, spike it--historically dark rum was often stirred in. Like I've said before, shrubs are a great way to revisit our colonial past without the fear of the stockade, trampling horses, dysentery, cholera, yellow fever, outhouses, or lack of proper bathing. Shrubs are a precursor to the modern day soft drink; mildly effervescent and nonalcoholic. Not only were they refreshing in the hot summer months; the vinegar helped preserve the drink so they didn't need refrigeration, something difficult to come by at that time. I do recommend refrigerating modern day shrubs like this one because 1. we can (in your face, colonials) 2. it will keep longer 3. I think it tastes better cold. Shrubs are also a great way to use up fruit that might be slightly too soft to pleasantly eat out of one's hand but otherwise perfectly fine to eat. In this case, I combined deep red, sweet cherries and blueberries to make a drink that is as dark purple as it is tasty. Impress your friends and take it to your next picnic or cookout! It required less than 10 minutes hands-on time but everyone who drinks it will be impressed.